Home » Blog » Empower Sales Conversations » B2B Enterprise Sales Leaders: “What do you do for your customers?” — Do your sales reps answer the same way you do? B2B Enterprise Sales Leaders: “What do you do for your customers?” — Do your sales reps answer the same way you do? Posted in Empower Sales Conversations, Increase B2B Sales, Presales, Quantify Customer Value, Sales, Why LeveragePoint? At B2B Global 2000 Enterprises only the CEO, Sales Leader, and their top 10% sales reps consistently succeed at addressing this question with customers; and qualify the opportunity in the process. Why is it so difficult to get all sales reps to do the same? Customer First Impressions Matter: According to Forrester Research, only 22% of sales meetings with executive level buyers of global companies succeed in “relating to my role, understanding my issues, and showing where they can help”. The result is about 8 of every 10 meetings your reps have with senior buyers miss the mark! A typical B2B Enterprise salesforce has hundreds of these critical customer sales meetings every day. Failing to communicate with buyers early in the sales process means less second meetings, fewer customer collaborations, missed qualified sales opportunities, and lost deals that never get reported in the CRM. Your top 10% sales reps don’t need PPTs to answer the question, as effectively as their CEO and Sales VP, by a customer’s senior management. 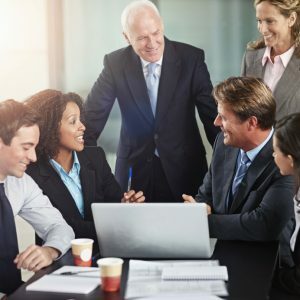 In fact, the best reps proactively address the customer early in the meeting this way: “Before I present our company and products, I will start with what we do for our customers.” Experienced enterprise sales pros adopt the sports cliché “the best defense is a good offense”, so why should any rep wait for the tough question? The stakes are high in B2B Enterprise markets for strategic, large volume opportunities. The environment is fiercely competitive, sales processes are lengthy and complex, multiple stakeholder meetings are held, intense technical “deep-dives” occur, and tough negotiations are expected. Highly productive B2B sales reps work only on qualified opportunities to avoid expending valuable time and expensive resources on unqualified opportunities. When asked by Sales VPs how they can increase the number of successful early meetings with decision-makers by 70-80% of their salesforce – the territory and new account reps commonly called the “middle of the salesforce” – I begin with focusing on why the top reps are successful. Your “middle” sales reps should answer early the question you know is top of mind with the audience as if YOU were the presenter! “I cannot be on every sales call; how can I be confident the right message gets presented to the right audience?” is the normal reaction. You’re wrong! A single screen, web-based Value Proposition with impressive financial results achieved when implementing your solution with a typical customer in their industry is a perfect way to start. Risky? Contrary, as according to Forrester, it’s riskier for your rep to give a 25-30 slide PPT overview presentation developed by Marketing that speaks to your company background, products, market share, financial strength etc. etc. etc. Since the decision-maker told your rep “Nice Presentation”, an unqualified opportunity usually gets logged into your rep’s sales pipeline. The impact of adding only one new qualified sales opportunity per year per rep on a salesforce of 400 reps with 320 (80%) in the “middle” selling a $250,000 solution expands your qualified sales pipeline by $80,000,000. B2B Enterprises have outstanding pre-sales technical support talent as a resource, so the Sales VP is confident that teaming these rock-stars with front-line sales managers on $80 million of qualified opportunities will certainly increase competitive wins! Assuming conservative average close rates on your qualified deals at only 10-20%, the revenue impact is $8-16 million without adding any new resources. Today, digital, cloud-based sales tools are providing an edge to successful B2B Enterprise sales reps by delivering the Sales VPs’ impactful messages consistently to decision-makers early in the sales process, differentiating their offering versus competition. There are three key benefits reps experience when using a Digital Smart Value Proposition early in the sales cycle. Establishes Credibility: Every Value Proposition has financial results, business drivers, and relevant content. The customer sees early in the presentation that the rep came prepared to speak about the right business challenges impacting their company. The rep goes into a sales presentation confidently knowing the Value Proposition approved by the Sales VP resonates with the audience. Customer Collaboration: Value Propositions show typical financial results (reducing costs, increasing margins, ROI, TCO, etc.) and customer value messages from companies in their industry that have been successful with your offering. Customers recognize fast your solution has driven impressive results solving some of their own challenges. The customer is interested when they ask your rep to “change some numbers on assumptions” that apply better to their company. Mutual Qualification of Opportunity: Value Propositions must include aSmart capability enabling reps to change customer volunteered numbers that calculate in real time revised cost reductions, margins, ROI and TCO displayed clearly with charts and graphics. The rep now feels confident they can ask the question, “Which areas of the Value Proposition interest you the most?” At this stage, a decision-maker will qualify or disqualify themselves from further exploration of your offering via a second meeting. Remember, qualifying opportunities early with a shared customer vision is a winning formula 74% of the time according to Forrester. Sales VPs’ answer to the tough question can be communicated on customer calls consistently by reps for a specific industry, using the right messaging and right content- all on one digital screen in 15 minutes or less. Reps must be able to “find” the right Value Proposition in 60 seconds or they will defer back to the PPT marathon pitch. Sales VPs’ approved messaging and format to present “What we do for our customers” is adopted within days by reps who start experiencing more successful customer meetings fast. Training must be minimal and web-based. Updates to Value Propositions are accomplished easily via the cloud, and changes are made available to every rep simultaneously. Sales VPs see more qualified sales opportunities enter the sales process using high caliber support resources during the pre-sales cycle. Technical and SME professionals actually get excited about seeing real customer data before their first customer meetings. Ben Franklin wrote: “By failing to prepare, you are preparing to fail.” Value Propositions, introduced early, show the customer a presentation that does address their key challenges from a company’s sales rep that came prepared to talk about their business. A Digital Smart Value Proposition can be customized for each customer by editing throughout the sales process by sales and pre-sales collaborating with the customer’s team. Value Propositions must be stored securely and encrypted in the cloud, so your appropriate sales teams can collaborate remotely among themselves and Sales VPs on demand. In today’s digital world, Value Propositions are becoming mandatory to take the complexity out of customer presentations and make it simpler so Sales VPs’ messaging can be on every key sales call, simultaneously with hundreds of reps, so reps don’t need to lose an opportunity early in the sales cycle by presenting the standard 25-30 slide corporate presentation to uninterested decision-makers. As more Millennials enter your salesforce weekly, a Smart digital sales tool will guarantee adoption and a faster ramp-up time to closing their first qualified opportunity. Start small with a Digital Smart Value Proposition for a single strategic product having competitive differentiation that can be created in days, and test with a core team of sales and pre-sales to provide feedback. You will enjoy the results!